Many of these brewing operations are small businesses that brew and deliver in their surrounding communities. To promote themselves, they will often take part in local music festivals, street fairs and other live events that draw festive crowds. 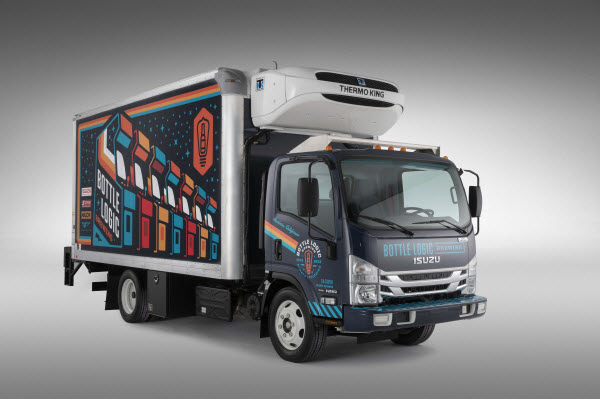 They quickly find themselves in the dilemma of requiring a dual purpose vehicle—one to make their regular deliveries and one to promote their brewery at live events. The chassis is an Isuzu NRR with a 150-inch wheelbase and a robust 19,500-. GVWR to accommodate heavier payloads. The Isuzu low cab forward design features a 49.5-degree wheel-cut angle for exceptional maneuverability, allowing drivers to make deliveries and set up displays in tight quarters that cannot be negotiated by conventional cab trucks. Outstanding visibility allows drivers to see the ground within eight feet of the front of the truck, and an 85-degree door-swing angle means entry and exit are easy for deliveries and set-up that are faster and more efficient. The NRR is powered by Isuzu’s proven 5.2-liter turbocharged diesel engine which generates 215 horsepower and 452 lb.-ft. of torque, for an impressive combination of fuel economy and performance. And its robust B10 durability rating of 375,000 miles, is evidence of the engine’s long-term dependability.